OFFICER'S OATH is a story that everyone should read. It is not a 'birther' story. 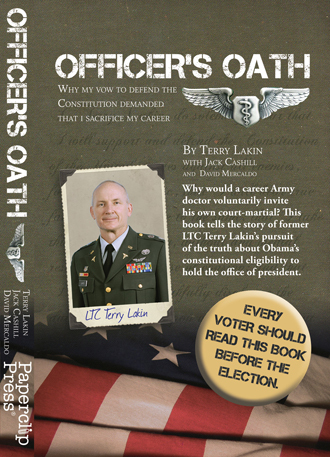 It is, rather, the story of a man who made a principled decision to adhere to the oath he willingly took as an officer in the United States Army. It is a story of the personal consequences of that decision and the far-reaching effect it has had on the eligibility issue. Jack Cashill, author of numerous books, assisted Terry in telling his story. David Mercaldo, a New York-based author, has interviewed and written vignettes of the many people who contributed to Terry's case. A number of notable individuals have also contributed essays on key subjects relating to the issue. The book is a complete story of Terry's decision, the immediate consequences, and the long-range effect of Terry's decision and should generate a substantive and engaging dialogue on the issues addressed. Overall it is a unique book and an engaging story. Initial readers have given it high marks. It will be of great interest to supporters, detractors, and those who may have had little contact with the issues for which Terry has stood. Reseller accounts will be available at industry standard rates for bulk sales and resale. Please visit our Contact page for information. See the right bar for ordering information. 2. Are You Still Free? Walter Francis Fitzpatrick III: A Republic... do or die! Daria Novak: Are we on the road to political China? Ed Noonan: Terrorists got more constitutional protection than Terry did. Sarah Redd: I started out as a Democrat. Rock Peters: You can't run a country on personality. Patra Minocha: Political activism is not some sort of competitive sport. Theresa Cao: Sometimes truth shouts from the mountaintops! Gordon Smith: Terry is the best-kept secret in America. Rudy Davis: I see the world through the grid of my faith. Brent Morehouse: Americans have been asleep. David Moxley: The least I can do is let Terry tell his story. Linda M.: I'm aghast at the ambivalence of the American people. The Reverend David Manning: Everybody in Congress knows this man is a fraud! Jerome R. Corsi, PhD: Can our military raise a legal question? Catherine 'Kate' Vandemoer, PhD: God had a great deal to do with the Constitution. Greg Lakin, DO, JD: I believe what my brother did was an act of patriotism! Lt. Col. Robert A. Perrich: Terry is in a war, and I'm fighting alongside him! Margaret 'Ducky' Hemenway: This issue is one of paramount national importance. Joseph Farah: We're in trouble in America! We?re losing our respect for the rule of law. Maj. Gen. Paul Vallely: I don't think justice for Terry will come to pass. Lt. Gen. Thomas McInerney: I'm proud of Terry! He did what he felt he had to do. Cmdr. Charles Kerchner (Ret): I've got deep roots in this country and I?m not leaving! Capt. Pamela Barnett (Ret): Our freedoms are at stake at this point. Jim and Peggy DeJarnatt: We need to get the message out! Miki Booth: He's shredding the Constitution. Sharon Rondeau: We need to restore the rule of law. Peter Boyles: We still have no answers. The questions are still enormous! Maj. Stefan F. Cook: I Made the Decision.